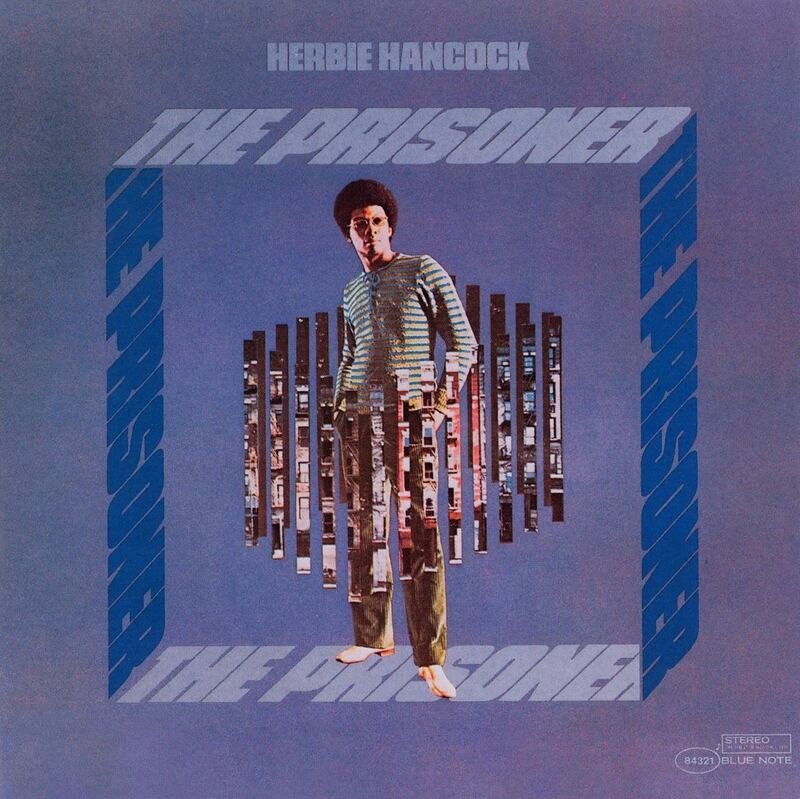 “As one of the first albums Herbie Hancock recorded after departing Miles Davis’ quintet in 1968, as well as his final album for Blue Note, The Prisoner is one of Hancock’s most ambitious efforts. Assembling a nonet that features Joe Henderson (tenor sax, alto flute), Johnny Coles (flugelhorn), Garnett Brown (trombone), Buster Williams (bass), and Albert “Tootie” Heath (drums), he has created his grandest work since My Point of View. Unlike that effort, The Prisoner has a specific concept — it’s a tribute to Dr. Martin Luther King, evoking his spirit and dreams through spacious, exploratory post-bop. Often, the music doesn’t follow conventional patterns, but that doesn’t mean that it’s alienating or inaccessible. It is certainly challenging, but Hancock’s compositions (and his arrangement of Charles Williams’ “Firewater”) have enough melody and space to allow listeners into the album. “Generally speaking, I’ve been able to get closer to the real me with this album than on any other previous one.” This is a value judgement of Herbie Hancock, the gifted young upper-echelon jazz pianist-composer who left the charismatic and nutritious aura of Miles Davis’s group to venture into leading his own band in order to cultivate his imagination and to shape his own musical concepts. And what then does Hancock refer to when he mentions “the real me”? I recognize that no one can really define the real anybody, but on the other hand clues and intuitive responses can be confirmed in various degrees to refine a view of someone. During the last couple of years Herbie and I have had several lengthy dialogues which I consider as helpful intake sources to discover what psychologist Benjamin Bloom calls the “cognitive-affective domains” of Herbie Hancock as they may relate to music. Therefore, I have included some excerpts and interpretations which may provide some insight to the Hancock mosaic. Speaking of developmental influences on Herbie Hancock, aside from Gil and Miles, there is Bill Evans who was the first pianist Hancock could truly identify with. When Hancock started in jazz, George Shearing and Bud Powell were his forces of effect, and Hancock possessed a more emphatic harmonic approach before his melodic approach was secure. As for Bill Evans, Hancock exclaimed, “When I heard Bill, I knew that was it! Harmony has always gassed me. I was intrigued with different chord sounds and Bud led the way for me; he played a large part in my growth and development.” Hancock’s melodies are simple and he tries to get novel relationships between chords, each succession of chords presents an increment of surprise. In effect, there is no establishment of a strong tonal center. And in the way the chords follow each other, there is sufficient space and freedom between chordal relationships so that soloists con feel free to comment comfortably and in the way they feel. Joe Henderson is one of today’s top saxophonists and he creates fire in the group. Fluegelhornist Johnny Coles sounds like a young lion. Hancock mused, “Johnny moves by the moment. He plays things such sheer beauty I wonder where it’s from. He is just gifted enough to grab the notes he hears and get them out and it’s pure soul that comes out. Coles’s things are related to Miles’s things, but Coles doesn’t pick the same notes even though I believe they are conceptually similar.” And trombonist Garnett Brown, who has been very active in the New York studios and prominently featured with the Thad Jones-Mel Lewis Jazz Orchestra is considered a lucky circumstance for Hancock, as Herbie feels that Garnett’s experience is very valuable to the group. On this album wherein Hancock uses a nonet, he cited the merits of Hubert Laws in particular, pointing out that Laws is one of the finest flute players in classical or jazz; Laws is used by the New York Philharmonic Orchestra and other classical units for flute solos just as he is heavily featured on numerous jazz settings. “The Prisoner” is in sections with an ABCB scheme. Joe Henderson’s solo in the middle section shows the use of the freedom and space provided by Hancock’s writing. The interest here is on the sound. The composition was inspired by Stravinsky’s “Rite of Spring”. Hancock’s arrangement of Buster Williams’s “Firewater” recalls Gil Evans’s conceptual model. The title indicates the social duality of the oppressor and the oppressed. The fire and water idea symbolizes, for Hancock, the feeling of fire in violence and in power play and the feeling of water in Dr. King. Likewise, “He Who Lives in Fear” refers to the fact that King had to live in an atmosphere charged with intimidation. Via a skillful manipulation and reshaping process of a hip jingle Hancock did for a television cigarette commercial, he evolved a completely new piece with a different melody and harmonic pattern. The juxtapositions he made came out beautifully with another Hancock gem. Finally, “Promise Of The Sun,” a fetching melody you won’t forget easily, symbolizes how the sun promises life and freedom to all living things and yet blocks are not yet free. Herbie’s last album for Blue Note came about as a result of Herbie’s newfound fame. Warner Brothers had made an offer that Herbie couldn’t refuse; he was given a sizable increase in funds for reacording and the music was to be treated like a pop act. Herbie had signed a deal with Blue Note that was unrealistic, and through his close relationship with Alfred Lion, and, by this time, Francis Wolff, he was able to complete his contract with Blue Note with one final album project. The Prisoner was not your typical Blue Note date. Even though Blue Note had begun to use larger orchestral concepts to showcase their roster, they had not indulged anyone with a large budget to make an ‘art’ album. Quartet, quintet and sextet were the norm for Blue Note, and only Stanley Turrentine, Gene Harris and maybe Lee Morgan could get an expanded budget for something big. Andrew Hill had a couple of big dates, but the complexity of his music often led to musically disappointing sessions. Herbie had developed a style of orchestration that evolved out of the necessity of capturing his pianistic accompaniments. This sound, this sense of orchestration, was unique, and could only have come from the mind of Herbie. He used this date to showcase his working band at the time (Coles, Henderson, Brown, Williams and Heath), and to place them in a larger, more textural environment. So on April 18th, 21st, and 23rd of 1969, Herbie’s Sextet (and an additional ensemble of three winds and two brass) headed out to Rudy’s with an arsenal of sound, and the musicians to make it work. The sound of The Prisoner has never been successfully duplicated by anyone, and the album remains a standout achievement in Herbie’s career. “I Have A Dream” was initially submitted to Miles in January 1968, and by the time April 1969 came around, the song had undergone many noticeable changes, the first being that is is a finished piece, and arranged. The form is clearer, and the mood is in tune with the composition. The reverb of the Van Gelder studio brings out an otherworldly haze to the texture of the instruments, and this fits in nicely with the smear-and-slog phrasing employed by the band. The two alternate takes from The Prisoner sessions used in this collection demonstrate something that haunts musicians at live to two-track studio dates. Both “The Prisoner” and “Firewater” have great solos by Herbie and Joe Henderson, but the ensemble playing is inconsistent at best. Perhaps it is the unorthodox method in which the music was orchestrated, or lines that have to be played by the musicians that could be a little more forgiving. To this day, Herbie has never revisited this project, nor has anyone performed any of this music in a form closely resembling the album. Such a pity. During this time, Herbie began composing television commercials for a few agencies in town. He composed a jingle for Silva Thins cigarettes, and it was so beautiful, he wanted to record the song for his own album, but the agency didn’t give Blue Note permission. Herbie changed the title to “He Who Lives In Fear” and recorded it on The Prisoner session. After The Prisoner was recorded, Herbie signed a deal with Warner Brothers Records with whom he recorded the soundtrack to a Bill Cosby animated feature called Fat Albert Rotunda. Once again, his working sextet was utilized (Coles, Henderson, Brown, Williams and Heath) along with some additional instruments to lend the music apronounced rock/soul feeling. “Jessica” and the incredible “Tell Me A Bedtime Story” Came from this project. Herbie continued to make studio dates, (Steve Marcus for Vortex, Roy Ayers for Atlantic), Joe Henderson’s classic Power To The People (on Milestone), Phil Woods (Round Trip for Verve), Gypsy Cry for Attila Zoller on Empryo, Ron Carter’s recording debut as a leader – Uptown Conversation also for Empryo, George Benson’s The Other Side Of Abbey Road for A&M, and the incredible album on Empryo led by Miroslav Vitous called Infinite Search. By 1971 he was a house pianist at CTI Records. What a career! The Sextet was now beginning to work more frequently, even travelling to the West Coast in May. Down Beat positively reviewed the Sextet in performance in their July 24, 1969 issue. The Sextet played Newport that summer, and later in July, they had two weeks at the Village Vanguard (with Joe Farrell subbing for Henderson). Jimmy Garrison joined the band for a week at the Agua Lounge in Philadelphia. Things were looking up. By 1971, a change in personnel had occurred, and electronic instruments were being added. Herbie’s deal at Warner Brothers allowed him to do anything, and he proceeded in making the most uncommercial but inspired music. The Sextet was a popular group and by 1973 had hit the top of the jazz scene. But Herbie was losing money on the group, and changing times led Herbie to reevaluate his musical situation. Enter Head Hunters, the hit, and you’re back to the beginning of this story. But my quest to find out more about Herbie didn’t end with the acquisition of every recording he was on (well, almost everything). I actually got to work with him. On a record, his 1995 album The New Standards (Verve). I was hired because I was familiar with Herbie’s style and method. When I first met with him, he looked at me and probably thought: “My worst nightmare, a fan with a pencil and some manuscript paper,” but once we got to work, things began to happen. I understood his moves, and soon we had an album crafted to take advantage of his style and prowess. The recording did amazingly well all over the world, and is widely imitated for its concept of adapting pop melodies to the jazz sound. See, I wasn’t crazy to study his music. This album was much more of a transitional event in Herbie Hancock’s career than anyone realized at the time. Beyond the quality of the individual compositions and performances, it is best appreciated as a chapter in various portions of his musical history – the last of his seven Blue Note albums, the first of two by what would prove to be the first Hancock sextet, and the second and final statement in what might be considered Hancock’s Gil Evans phase. The pianist had left the Miles Davis quintet during the Summer of 1968 to form his own group; and, to the surprise of many, it was an economically risky sextet rather than the trio that might have had an easier time as a business proposition. Yet Hancock required horns – and a section with a range of voices at that – to continue his explorations of the engaging yet open music he had introduced on his March 1968 session Speak Like A Child. In the notes to that album, as well as in Herb Wong’s original notes for The Prisoner, Hancock acknowledged how Gil Evans had impressed him by writing parts that could stand alone melodically for each instrument in the ensemble, and voicing these various individual lines with wide intervals that omitted clear chordal signposts. This created an open and polychordal feeling that, together with the more basic rhythmic approach that Hancock described to Wong, presented an opportunity to pursue music that was appealing to a broad base of listeners while remaining challenging to those who played it. Given its April 1969 recording date, The Prisoner is as interesting for what it omits as what it includes. The combustible rhythmic energy that characterized the avant-garde of the period is only hinted at (most clearly during Joe Henderson’s solo on the alternate take of “The Prisoner”), and the bracing sting of amplification that jazz was beginning to borrow from rock plays even less of a role. (Hancock uses the electric piano he had come to play more frequently with Davis only during the ensemble portions of “He Who Lives In Fear” and the title track.) Instead he employs an expanded, nine-piece ensemble where the basic horns of his working sextet-trumpet, trombone and tenor sax – are joined by the more coloristic bass trombone, flute and bass clarinet. When applied to the superior melodic material provided by the leader and bassist Buster Williams, this ensemble produced a stunning sound that was no less powerful for its intimacy, a sound indicating that, had he so chosen, Hancock could have become one of jazz’s greatest arrangers. Yet he was too exceptional a player, communicator and leader of other musicians to settle for a life focused on score paper. The Prisoner lets us hear just how exceptional. The album employs a most contemporary theme, then and now – the struggle of African-Americans for their proper place in U.S. society – yet the music never preaches and never rants. The writing is exceptionally beautiful, even for Hancock, capturing the dignity and idealism of the Civil Rights movement. “He Who Lives in Fear,” as noted, had originally been created for a Silva Thins cigarette commercial, then retitled when the advertising agency would not grant permission for its use on the LP. “Firewater,” with its “Aren’t You Glad You Use Dial?” phrase at bar four, also has echoes of Madison Avenue. Still, the music never sounds less than true to the album’s stated theme, which is further proof of Hancock’s ability to merge the accessible and the profound. There is some great playing here from Henderson, who makes his sound especially flexible in this setting to reflect the full range of colors in the writing. Johnny Coles is also impressive, particularly where he seems to argue with the ensemble in the manner of a less vicious Miles Davis on the master take of “The Prisoner.” I have to admit to my disappointment when this album was first released though, because there had not been more room for solos. Recorded on April 18 (Track #2, 4, 6), April 21 (#1) and April 23 (#3, 5, 7), 1969 at the Van Gelder Studio, Englewood Cliffs, New Jersey. Originally recorded by and remastered in 2000 by Rudy Van Gelder.